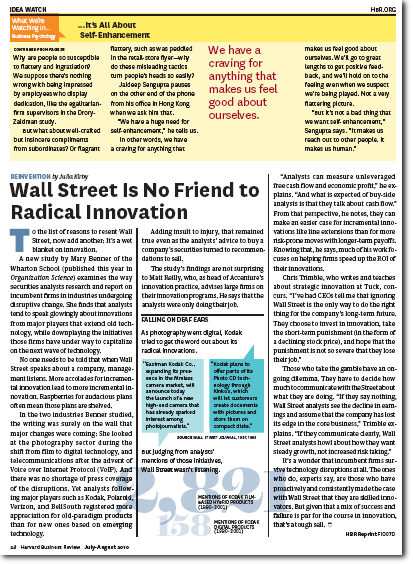 From the July-August 2010 issue of HBR, Wall Street Is No Friend to Radical Innovation, by Julia Kirby. She finds that analysts tend to speak glowingly about innovations from major players that extend old technology, while downplaying the initiatives those firms have under way to capitalize on the next wave of technology. One example is Kodak's innovations in the field of filmless cameras, as early as 1991, and its attempts to get the word out on this innovative technology. Guess what? Between 1991 and 2001, there were more than two thousand mentions (2,821 to be precise) of Kodak film-based hybrid products, while only 158 mentions of Kodak digital products in the same period. Go figure. As has been written several times, obsessing over quarterly financial results can very often lead management to lose sight of the larger picture and the long-term vision that the company needs to have. After a time even the myopic focus on short-term results stops yielding results. What is also true is that you can manage what you can measure. Incremental improvements to existing product lines often produces results, measurable results, in the short-term. This is measurable. Manageable. And therefore rewarded. And encouraged. 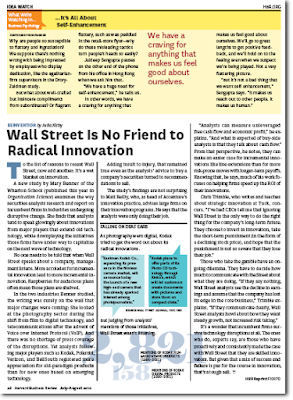 Long-term radical, disruptive innovations are by their very definition anything but sure successes. Even with a good idea to begin with, executing successfully requires often enough a different mindset than the one that provided the genesis for the disruptive innovation in the first place. An innovative idea is like a fertile piece of land. Successful execution is the crop that is sold in the market. And a chasm exists between people who are good at finding that piece of fertile land and those that are good at cultivating that piece of fertile land.